The Rev. 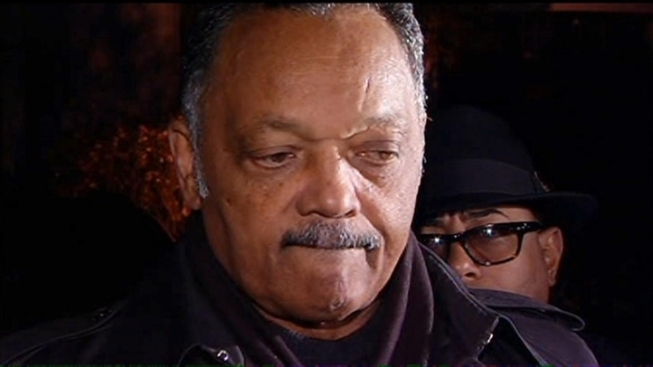 Jesse Jackson emerged from his south side Chicago home Wednesday afternoon and told reporters the entire family feels "a great sense of pain" over his son's resignation from Congress. "This is no easy matter for us to take," he said. "This is a big moment for our family and yet we'll face tomorrow with a prayer and hope, and we find so much support from so many people." His son, Jesse Jackson Jr., on Wednesday resigned as congressman for Illinois' 2nd Congressional District after being away for nearly six months as he battled mental health issues. "He will get well in time, but it's not the kind of illness where you can put a timetable on it. If you're bleeding, you get a Band-Aid. If you break a leg, you get a splint," the elder Jackson said. "This kind of internal, unresolved challenge, you have to take the time and the environment, so between the political office and the press and politics and the fiscal condition, he couldn't do it all."